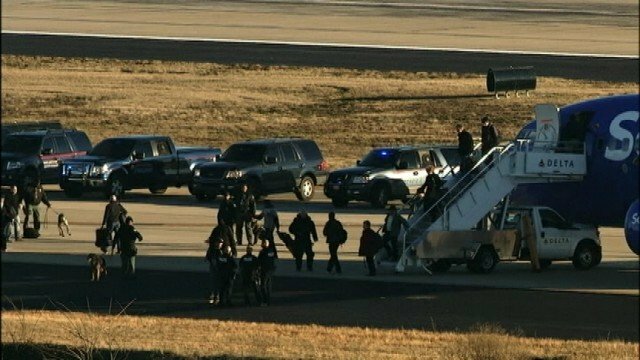 Delta and Southwest flights have been searched by police at Atlanta’s airport after “credible” bomb threats, US officials say. Airport spokesman Reese McCranie said the threats were received against Delta and Southwest flights coming from Portland and Milwaukee respectively. Reese McCranie said both planes had landed safely and had been evacuated. Two US fighter jets escorted the planes into the Hartsfield-Jackson International Airport. The airport later said no bombs were found. The bomb threats were made online – reportedly on Twitter. A bomb squad and sniffer dogs were involved in the police search after the planes landed. Reuters quoted Southwest as saying that 86 passengers were on board the flight, and that they were being re-screened. There was no immediate comment from Delta officials. The busy Hartsfield-Jackson International Airport is home to Delta, serving nearly 100 million passengers. This is not the first airport bomb scare in the US this week. On January 19, New York’s JFK airport was at the centre of another threat, involving at least one aircraft. No bomb was found.